The Days of Johann, an agility dog! 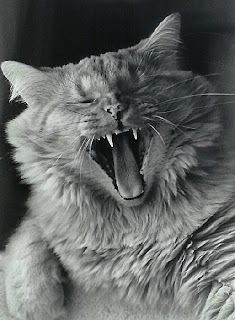 : Yawning is contagious! Our Twitter friends over at Dog Trust told us about an article on BBC News today. Mum and I were doing a little experiment the other day, before we even read this article. I was sitting up on the landing of the stairs, and I yawned. So then Mum yawned, and what did I do? Yep, I yawned again. And this wen t on for about 3-4 times in a row. My kittie bro Wiggy does the same thing. When Mum yawns, Wiggy yawns. See? I know, I know, we're all just a bunch of yawners around here, BOL!!! I'm getting well. I've kept my food down for about 36 hours now. No poo yet, but I bet it's gonna be a nice one when it happens. I'm feeling a little better, but still don't have my energy back where it was end of last week. Guess we'll see how I'm really feeling when we go to agility practice in the morning. Hope you all have a great day! Weather sure is nice here, hope it is for you too. When I first heard about that article, I couldn't wait to try it out on Cruella and Molly. Can you believe that both of them just acted like I was crazy? Neither one yawned!